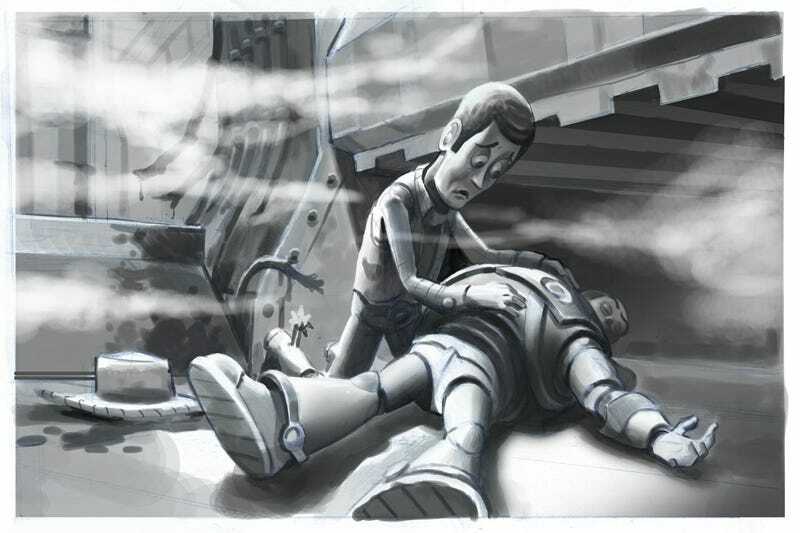 Before Pixar sent Andy to college and the toys to daycare, a possible version of Toy Story 3 had a malfunctioning Buzz Lightyear shipped off to Taiwan, where the other toys go to rescue him. And, well, we're darn glad that we ended up with the tear-jerking Toy Story 3 we got. A little Disney/Pixar history: Before Disney acquired Pixar in 2006, the two companies signed a three-picture deal in which Pixar would produce three films for Disney, the first of which was Toy Story. When it looked like the companies would not renew their production agreement, Disney started Circle 7 Animation, a CG studio that would produce sequels to Pixar's Disney-owned movies. Circle 7 began work on a sequel to Monsters Inc. as well as Finding Nemo 2 and its own version of Toy Story 3. Jim Herzfeld wrote one draft of Circle 7's Toy Story 3, a script that was later polished by Bob Hilgenberg and Rob Muir (who also wrote Circle 7's Monsters Inc. sequel script). In this version, Buzz Lightyear starts malfunctioning, so his fellow toys ship him back to his manufacturer in Taiwan. But when they learn of a massive recall on Buzz Lightyear toys, Andy's toys fear that Buzz will be destroyed, so they head to Taiwan to rescue him. Visual development artist Jim Martin provided concept art of some of the key moments. You can see a few piece below, and more on his website. It's not that the recall plot itself is awful (although "The toys race to rescue one of their own" feels a bit like a retread of Toy Story 2), and we did get a moment of near-destruction in Pixar's Toy Story 3. But this story, at least in this brief synopsis, misses the themes of growing up and moving on that made Pixar's third Toy Story movie so powerful. Ultimately, of course, Disney ended up buying Pixar, and after Pixar's leadership took control of Disney's animation group, they absorbed much of Circle 7's staff into the group. And Lee Unkrich ended up directing the Toy Story 3 we know and love.